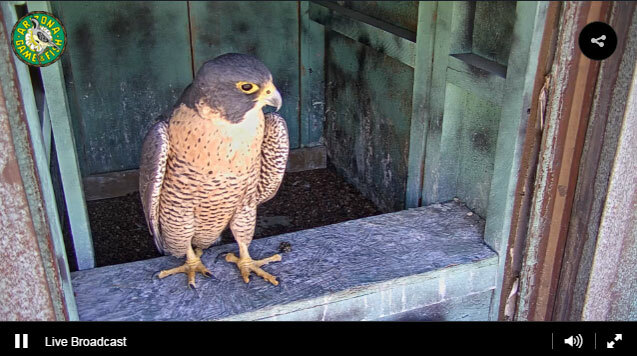 A peregrine falcons in the Phoenix nesting box on March 10, 2016. High above downtown Phoenix, peregrine falcons have been nesting for more than a decade — and now the public can get the best the view of them yet. Arizona Game and Fish Department recently renovated the falcons' nesting box atop the Maricopa County Administration Building on Third Avenue and Jefferson Street. The agency also upgraded the video equipment and relaunched the livestream, which is now available on Game and Fish's website. “This is a perfect example of wildlife being everywhere. We think people will be fascinated watching this pair of peregrine falcons and getting a glimpse into nesting, incubating eggs and rearing young, all in live time,” said Randy Babb, watchable wildlife program manager for the Arizona Game and Fish Department. It hasn't always been easy to attract breeding pairs to the box, and only a few chicks have survived long enough to leave the nest. But since the site's renovation, "the peregrines have been spending more time at the nest box, indicating they intend to nest there again this year," the agency said. So while you're probably more likely to catch the birds preening and snoozing — not hunting prey — viewer discretion is advised.